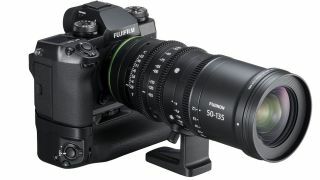 Announced alongside the X-H1, which we took a closer look at here and really rate as one of the best 4K cameras right now, Fujifilm has taken the wraps off two new cine lenses for its X-mount camera: the Fujinon MKX 18-55mm T2.9 and the MKX 50-135mm T2.9. These are essentially the same lenses that were originally released for Sony's E-mount last year. Between them they cover a total focal range equivalent to 27-206mm in 35mm terms, and both can maintain a constant aperture of T2.9 throughout their entire zoom ranges. Both lenses are designed to be compact and lightweight, each weighing 1,080g and measuring 87 x 206.6mm, and both also have a filter thread of 82mm. The uniformity of design between them is intentional, as this allows users to quickly swap between the lenses without needing to make complex adjustments to their rig setup. Fujifilm also promises superb optical performance across the lens's entire zoom ranges, with beautiful bokeh and no lens breathing. The lenses have also been designed to minimise focus shift while zooming. With three fully manual rings for adjusting focus, zoom and aperture, both lenses are designed for tactile and precise manual operation. Both also have a gear pitch of 0.8m, making them fully compatible with third-party video accessories, and have macro functionality for close-up work. The MKX 18-55mm T2.9 lens is constructed of 22 glass elements in 17 groups, with 6 super extra-low dispersion lens elements and 2 extra low dispersion lens elements, while the MKX 50-135mm T2.9 is also made up of 22 glass elements in 17 groups, but with 2 extra-low dispersion lens elements and 2 super extra-low dispersion lens elements. The Fujinon MKX 18-55mm T2.9 and the MKX 50-135mm T2.9 are both expected to be available in spring or summer of 2018, priced at £3499/$3,999.95 and £3799/$4,299.95 respectively. For more information, visit Fujifilm’s official website.